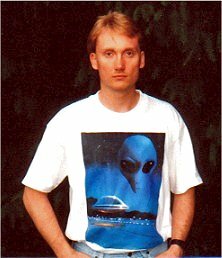 Founder of yet another "non-profit" UFO organization. Makes unsubstantiated claims, has fingers dipped into every paranormal/new age pie imaginable including UFOs, ghosts, pyramid healing, bigfoot. Ripped off UFO reports from the National UFO Reporting Center website and posted them as his own with a copyright! McGee also runs an "awareness" conference at a state park and played host to Reed UFO Fraud supporter Dan Iaria even though the Reed UFO Fraud had been exposed and McGee had been informed about it. McGee uses colorful acronyms like OWCs (Off World Craft) and OWVs (Off World Vehicle). You can read fine articles at his site, such as "Martians Know Quantum Physics" and "Interacting with the Greys". McGee is seeking investors so he can build a "state of the art National UFO Museum" complete with "an IMAX theater (to be housed within a slightly scaled down replica of the great pyramid of Giza - fully restored and aligned to the magnetic north..." McGee hopes to have the new UFO museum open "on, or before December 31, 2011 in lieu of the prophetic year of the Mayan calendar, 2012." And we all wonder why UFOs are never taken seriously...McGee is another fine example of what's wrong with UFOlogy.